Arriving just over two years after 2016’s “Paging Mr Proust”, the new album from Minnesota’s finest is a departure, in that most but not all of the songs were co-written with other artists. Two Gary Louris originals round out the set. Whilst “Paging Mr Proust” was a return to form after the, in my mind, lacklustre and inconsistent “Mockingbird Time”, this is a step back up to the 1992-2003 heyday. From the moment the drums and bass guitar strike up an instantly recognisable Jayhawks groove on “Come Cryin’ To Me”, until the final chord of “Leaving Detroit” fades out, this is a treat for fans of the band and anyone who enjoys good music. None of these tracks outstay their welcome, the melodies linger and at least 3 tracks, “Gonna Be A Darkness”, “El Dorado” and “Carry You To Safety” would go straight onto a “Best Of” compilation. “Gonna Be A Darkness” joins Mazzy Star’s “Look On Down From The Bridge” and Bruce Springsteen’s “Land Of Hope & Dreams” as songs that speak to me powerfully about death. Hearing Karen take a couple of lead vocals is a pleasant surprise. Hopefully we’ll get to see them over in the UK next year and hear some of these tracks in the flesh. Whilst only the passage of time will dictate the place this album eventually settles in the band’s canon, it certainly feels like it would sit comfortably just behind “Hollywood Town Hall” and “Rainy Day Music”; their 1997 masterpiece “Sound Of Lies” still standing out as their finest work. 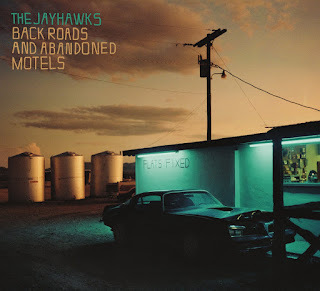 In summary, if you like the Jayhawks, buy this album. If you like “alt-country, Americana, roots rock” or whatever label you’d apply, buy this album. You should, they are a fantastic band. Seen them live 3 times. Hope to see them again.